Veesible at latitudes atween +90° an −30°. 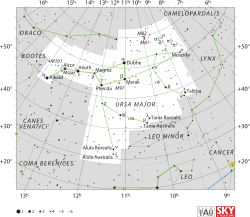 Peter’s pleuch is the constellation Ursa Major meanin 'muckle beir', that's a uissfu pynter tae the north. Ane o the starns is kent as Jack aside the middle horse. This page wis last eeditit on 20 August 2015, at 17:14.